Last month featured the somewhat out-of-place northern forest habitat in the Thumb. A rare inhabitant of this woodland is Painted Trillium, a State Endangered wildflower, tucked away in the quiet backwoods of the Blue Water Area for centuries. Painted Trillium was first recorded in Saint Clair County around 1900 by Charles K. Dodge, the City Attorney for Port Huron, a noted Michigan botanist, and great advocate for setting aside the Port Huron State Game Area. 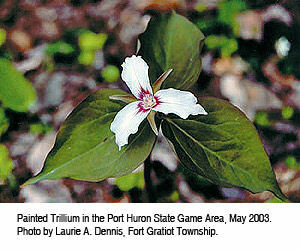 Dodge found Painted Trillium in "woods at Bunce's farm" south of Port Huron, and near Ruby. According to State records, only six Painted Trillium colonies now remain in Michigan. All six are in Kimball and Clyde Townships in Saint Clair County, an isolated outpost at the western edge of its range in North America. The next closest plants are near the Georgian Bay region of Ontario. A Wisconsin colony was planted. A record from Berrien County was probably a collector's record keeping mistake. A Sanilac County colony was destroyed years ago. At least four other colonies in Saint Clair County were needlessly destroyed by development in the 1990s. Painted Trillium is rare or uncommon throughout its range, which extends from southern Quebec and southern Ontario, down through New England and as far south as Georgia in the Appalachian Mountains where it grows only at higher altitudes in rhododendron and mountain laurel thickets. As the last glaciers began retreating about 13,000 years ago, Painted Trillium slowly advanced from the east into the Blue Water Area, apparently stopped by calcium-rich soils west and north, limited seed dispersal, and possibly by the warming climate. Wherever they grow, Painted Trillium require strongly acidic soils, usually with high organic matter content. In Saint Clair County, it thrives only in cool, moist, acidic sands in mature northern forests of Red Maple, Paper Birch, Eastern Hemlock, and Eastern White Pine, along with Bracken Fern, Wintergreen, Low Sweet Blueberry, Wild Sarsaparilla, Bristly Dewberry, Bunchberry, Canada Mayflower, Star-flower, Fringed Polygala, Partridgeberry, Goldthread, Clintonia, Indian Cucumber-root, and lycopodium. Its optimum habitat is near swamp, on small "tip-up mounds" created after large trees fall and uproot soil. Trilliums are in the Lily Family, having a large, solitary, three-petaled flower on a short stem above three large leaves. Most plant parts are in multiples of three. The genus name "Trillium" is derived from the Swedish word "trilling", referring to the whorl of three leaves. Swedish botanist Carl Linnaeus, who developed the modern system of taxonomy, named the genus Trillium in 1753 based on three North American species. There are about 40 trillium species native to North America, and 5 or 6 native to East Asia. Ten species are found in Michigan, five of which are State protected. Painted Trillium is the only State Endangered trillium species. Painted Trillium (Trillium undulatum) is best recognized by a small red to magenta chevron marking at the base of each white petal, the points radiating outward from the flower center like a brush stroke of red paint. The petal margins are wavy, or undulate, leading to the species name "undulatum". The plant is usually smaller than other trillium, sometimes only about six inches tall. The petioles or leaf stems are ¼ to 1 inch long. The leaves of other trillium in our area are usually sessile or stemless. Painted Trillium leaves appear slightly whitish, the new leaves bronzish, and are usually smaller than other trillium. Painted Trillium is a distinct species, not a hybrid or color variation of the common White Trillium or Red Trillium species. White Trillium (Trillium grandiflorum) is by far the most common trillium in our area. It grows in mature forests of Red Oak, White Oak, Sugar Maple, and American Beech, along with Mayapple, Yellow Trout-lily, and Solomon's-seal. If not overgrazed by White-tailed Deer, it tends to cover the forest floor like a vast snowy carpet in late spring. Some notice the aging petals of White Trillium in early summer, which turn pink or purplish before dropping off, and incorrectly conclude it is Painted Trillium. Slight petal coloration, usually pink, can also result from genetic variations, soil nutrients, soil pH, and temperatures. White Trillium is sometimes mistaken for Painted Trillium when infected with mycoplasma, described as intermediate between viruses and bacteria, causing green-striped petals and other abnormalities. There are several clusters of infected White Trillium in the Port Huron State Game Area. Red Trillium (Trillium erectum), or Stinking Benjamin as it is also known because of the flower's somewhat fetid odor, grows in wet forests, along the margins of wooded swamps of Silver Maple and Green Ash, amongst Jack-in-the-pulpit, Wild Geranium, with Marsh-marigold often nearby. Red Trillium patches are rarely as dense as White Trillium. Its petals range from a dusty maroon to red, although purple, yellow-green, and even white variations are known. Some mistake the color variations of Red Trillium for Painted Trillium. While other trillium in our area usually emerge and bloom over a few weeks in late April, remaining in-flower for about a month, Painted Trillium seems adapted to a cooler climate with a shorter season. It emerges and blooms within just one or two days in late May. By the end of a few weeks, depending on the weather, the petals drop off and seeds are developing. The Michigan Nature Association is still fundraising to purchase the Sharon Rose Leonatti Memorial Nature Sanctuary, a ten-acre site in Kimball Township containing the second largest Painted Trillium colony known in Michigan. To donate, send a check (write "Painted Trillium" on the memo line) to the Michigan Nature Association, 326 East Grand River Avenue, Williamston, Michigan 48895 or call them at 517-655-5655. The 4th Annual Saint Clair County Painted Trillium Tour is May 22 and 23 from 10:00 AM to 4:00 PM at the Pine River Nature Center in Goodells, Michigan. This is an excellent opportunity to see Painted Trillium, and learn about our unique woodlands.